For those who follow my blog for food, wine, etc. these posts titled “not so polite dinner conversation” ain’t that. It’s all about politics and religion. I’ve been watching Christians fuss at each other on John Branyan’s website (you can see some of his comments here on this blog). For people who each claim that they have the truth about a magical being, they do have a problem convincing each other. I wonder if it could be the lack of evidence? For those who don’t know, JB fancies himself a Christian comedian. He is funny in a hilariously unintentional way. Here in PA, there is a big report coming out that shows just how incompetent and malignant the Roman Catholic Church is when it comes to protecting children. It also shows how imaginary or evil this god must be if it exists and allows these horrible things to happen. It’s also been awhile since I’ve looked at one of the God Squad’s columns. This time Rabbi Gellman doesn’t fare any better than the last ones. IF you want to take a look at some of my past blog posts about the rabbi and his peculiar theology here are a few: Where Gellman tries to claim free will to excuse his god’s failures with child abuse. And tries to claim that it doesn’t matter if this god of his punishes people or not. What a lovely way to try to argue that those priests, etc are just fine as they are. Rabbis are known for their abuses too, so I’m sure the rabbi has some skin in the gam when trying to defend his fellows. Or you can just put “Gellman” in the search field to your right. The most recent is part of a sequence of questions the rabbi tries to answer. He is quite a twit in the initial questions, and pathetically wants to tell people how to love their family and pets. He does advise to just “omit” things, just so the pastor/priest/rabbi doesn’t have to say something less than what the rabbi considers “dignified” and so “graciously” says he will understand. Q: Is there any possibility that we have no free will? Could God control our every thought and action, causing us to act like robots? Is there any evidence that this is not true? — From J in Wilmington, N.C.
A: Yes, J. It is possible that free will is an illusion. Yes, it is possible that God controls our every thought and action causing us to act like robots. There are, however, several problems with this possibility. The first problem with the possibility that God controls everything we do is that God seems to be doing a really poor job. If God is all knowing and all powerful and all good, then there seems to be no good reason why the world is filled with so much evil and so many bad choices. The second problem with a world without free will is that nobody would be morally responsible for their bad choices. It would all be God’s fault. We humans would merely be, in your words, “robots” — and robots are not moral agents. Robots cannot be held responsible for what they do. Moral accountability requires free will. The third problem is that the Bible explicitly teaches us that we DO have free will precisely because God wants us to grow into our humanity and accept moral responsibility for our actions. The first text that clearly addresses free will is the Garden of Eden narrative. Adam and Eve eat of the forbidden fruit from the “tree of the knowledge of good and evil.” The act that humanizes them is an act of acquiring moral free will. Now there is a Christian problem with the Eden texts and it was highlighted in a roaring 16th-century debate between Erasmus and Martin Luther. Erasmus thought that people had free will. Luther thought that since the eating of the forbidden fruit was the original sin, people could never use their free will to overcome sin. People were doomed without the atoning death and resurrection of Jesus and thus were not really accountable for their sins. A more direct and definitive text bearing on the biblical teaching about free will is from Deuteronomy 30:19 (KJV), “I call heaven and earth to record this day against you, that I have set before you life and death, blessing and cursing: therefore choose life, that both thou and thy seed may live.” So God has set before us a choice between good and evil, life and death, and expects us to use our free will to make the choice of life. I do not know, nor can anyone know with absolute certainty, if free will is real or just an illusion in a fatalistic universe, but what I do know without a shadow of a doubt is that I can only live in a world where I am not God’s robot, but rather God’s partner. Again, the rabbi ignores that his god never mentions free will in the bible (wait a moment if you are Christian and think that it does) and does all it can to remove it repeatedly from many many people. Gellman must have free will or his god is a monster, and he can’t have that. We have Adam and Eve who have no free will, because they don’t have any idea what that is and they are made to be what they are. They have no knowledge of good or evil, and we have this god either allowing evil into the garden intentionally or that it was unable to keep it out. However, the rabbi now wants to claim that this god wanted that whole thing to happen, because it gave us free will. Really, then why would this god punish A&E for doing what it wanted? Indeed, why did it punish the “serpent” for doing exactly what it supposedly required, per Gellman? The rabbi does a great job at pointing out that with a god like is presented in the bible, and not his newly invented version, there is no reason to have evil in the world, so many bad choices, etc. And yes, no one would be morally responsible for their choices if a god made them do what it wanted, just like this god did in the story of Exodus, in the story of Judas’ betray which was required by this god, etc. Unsurprisingly, the rabbi doesn’t say where he gets his claim that the “bible explicitly teaches us we DO have free will precisely because God wants us to grow into our humanity and accept moral responsibility for our actions”. Perhaps someone else knows where this is, but having read the bible a couple of times, I don’t recall this at all. Indeed, the bible says the exact opposite of this in Romans 9 where it says that this god created peopled to be damned or saved at its whim aka “grace”, with no action by humans able to change this. “11 Surely, this commandment that I am commanding you today is not too hard for you, nor is it too far away. 12 It is not in heaven, that you should say, “Who will go up to heaven for us, and get it for us so that we may hear it and observe it?” 13 Neither is it beyond the sea, that you should say, “Who will cross to the other side of the sea for us, and get it for us so that we may hear it and observe it?” 14 No, the word is very near to you; it is in your mouth and in your heart for you to observe. Now, doesn’t that first paragraph sound rather familiar, someone who goes and gets this forgiveness? But this god doesn’t offer that, it says follow the commandments given in Exodus, Leviticus and Deuteronomy. You obey or your die. Not exactly a choice, no matter how it is presented. It is the classic “offer you can’t refuse”. This god is no more than a mafia don. And funny how this promise from this god never pans out, and this god, supposedly being omniscient, would know that his supposed chosen people would fail in his laws. You’d think a rabbi would know this, and not quote out of context, but cherry picking is nothing new to the theist, especially those who fancy themselves leaders and teachers. Unfortunately for Rabbi Gellman, he does not live in a universe where he is this god’s robot or partner. But he does reveal that what the believer wants is far more important than the supposedly holy texts that they claim are what they follow. What movement is Gellman a part of, do you know? pretty much the liberal Jews like the liberal Christians: they pick and choose what they want their god to “really” have meant and a chance to try to ignore what a vicious petty god that they have. I grew up within a hyper-calvinistic family. I often heard, “Every time a gnat bats an eye-lash, it was predestined before the foundation of the world.” It was hard for me to accept that I was going to hell for the sins I was predestinated to commit. Can be a bit frustrating. The point you are missing by a mile or so is that people who believe don’t need evidence, they have confidence. It is people like us that don’t believe that need evidence to support our lack of confidence. I disagree. If people who believe didn’t need evidence, then why have they spent the last two thousand plus year lookin for it, and repeatedly insisting that they have it, though they can never present it? I can read the words, and I can even parse them into a convoluted sort of sense. But damned if I can find a way to agree with you. The lack of evidence is itself is more than adequate to “support our lack of confidence”. Can you try this sentence again, but go directly to the point this time? 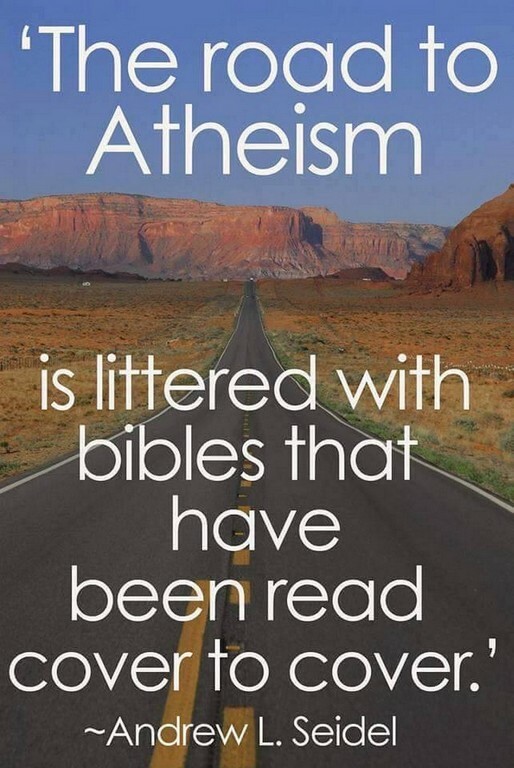 “The road to atheism is littered with Bibles that have been read cover to cover.” Amen. At this point I’m unconvinced that free will can exist in a Christian worldview. Just because the Bible says people can choose between good and evil, doesn’t mean they can FREELY choose. And, like you highlighted, it isn’t much of a choice anyway. It seems to me that the Bible as a whole contradicts free will.